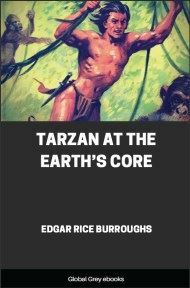 This is the tenth book in the Tarzan series. Tarzan, the king of the jungle, enters an isolated country called Minuni, inhabited by a people four times smaller than himself, the Minunians, who live in magnificent city-states which frequently wage war against each other. Tarzan befriends the king and the prince of one such city-state, Trohanadalmakus, and joins them in war against the onslaught of the army of Veltopismakus, their warlike neighbours. He is captured on the battle-ground and taken prisoner by the Veltopismakusians, whose scientist Zoanthrohago conducts an experiment reducing him to the size of a Minunian, and the ape-man is imprisoned and enslaved among other Trohanadalmakusian prisoners of war. In the dungeons of Veltopismakus, he meets Komodoflorensal, and together they make a daring escape. 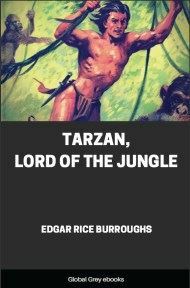 Esteban Miranda, who had been imprisoned in the village of Obebe, the cannibal, at the end of the previous novel, Tarzan and the Golden Lion, also appears in this adventure. IN the filth of a dark hut, in the village of Obebe the cannibal, upon the banks of the Ugogo, Esteban Miranda squatted upon his haunches and gnawed upon the remnants of a half-cooked fish. About his neck was an iron slave-collar from which a few feet of rusty chain ran to a stout post set deep in the ground near the low entranceway that let upon the village street not far from the hut of Obebe himself. For a year Esteban Miranda had been chained thus, like a dog, and like a dog he sometimes crawled through the low doorway of his kennel and basked in the sun outside. Two diversions had he; and only two. One was the persistent idea that he was Tarzan of the Apes, whom he had impersonated for so long and with such growing success that, like the good actor he was, he had come not only to act the part, but to live it—to be it. He was, as far as he was concerned, Tarzan of the Apes—there was no other—and he was Tarzan of the Apes to Obebe, too; but the village witch doctor still insisted that he was the river devil and as such, one to propitiate rather than to anger. It had been this difference of opinion between the chief and the witch doctor that had kept Esteban Miranda from the fleshpots of the village, for Obebe had wanted to eat him, thinking him his old enemy the ape-man; but the witch doctor had aroused the superstitious fears of the villagers by half convincing them that their prisoner was the river devil masquerading as Tarzan, and, as such, dire disaster would descend upon the village were he harmed. The result of this difference between Obebe and the witch doctor had been to preserve the life of the Spaniard until the truth of one claim or the other was proved—if Esteban died a natural death he was Tarzan, the mortal, and Obebe the chief was vindicated; if he lived on forever, or mysteriously disappeared, the claim of the witch doctor would be accepted as gospel. After he had learned their language and thus come to a realization of the accident of fate that had guided his destiny by so narrow a margin from the cooking pots of the cannibals he was less eager to proclaim himself Tarzan of the Apes. Instead he let drop mysterious suggestions that he was, indeed, none other than the river devil. The witch doctor was delighted, and everyone was fooled except Obebe, who was old and wise and did not believe in river devils, and the witch doctor who was old and wise and did not believe in them either, but realized that they were excellent things for his parishioners to believe in. Esteban Miranda's other diversion, aside from secretly believing himself Tarzan, consisted in gloating over the bag of diamonds that Kraski the Russian had stolen from the ape-man, and that had fallen into the Spaniard's hands after he had murdered Kraski—the same bag of diamonds that the man had handed to Tarzan in the vaults beneath The Tower of Diamonds, in the Valley of The Palace of Diamonds, when he had rescued the Gomangani of the valley from the tyrannical oppression of the Bolgani. For hours at a time Esteban Miranda sat in the dim light of his dirty kennel counting and fondling the brilliant stones. A thousand times had he weighed each one in an appraising palm, computing its value and translating it into such pleasures of the flesh as great wealth might buy for him in the capitals of the world. Mired in his own filth, feeding upon rotted scraps tossed to him by unclean hands, he yet possessed the wealth of a Croesus, and it was as Croesus he lived in his imaginings, his dismal hut changed into the pomp and circumstance of a palace by the scintillant gleams of the precious stones. At the sound of each approaching footstep he would hastily hide his fabulous fortune in the wretched loin cloth that was his only garment, and once again become a prisoner in a cannibal hut. And now, after a year of solitary confinement, came a third diversion, in the form of Uhha, the daughter of Khamis the witch doctor. Uhha was fourteen, comely and curious. For a year now she had watched the mysterious prisoner from a distance until, at last, familiarity had overcome her fears and one day she approached him as he lay in the sun outside his hut. Esteban, who had been watching her half-timorous advance, smiled encouragingly. He had not a friend among the villagers. If he could make but one his lot would be much the easier and freedom a step nearer. At last Uhha came to a halt a few steps from him. She was a child, ignorant and a savage; but she was a woman-child and Esteban Miranda knew women. "I have been in the village of the chief Obebe for a year," he said haltingly, in the laboriously acquired language of his captors, "but never before did I guess that its walls held one so beautiful as you. What is your name?" Uhha was pleased. She smiled broadly. "I am Uhha," she told him. "My father is Khamis the witch doctor." It was Esteban who was pleased now. Fate, after rebuffing him for long, was at last kind. She had sent him one who, with cultivation, might prove a flower of hope indeed. "Why have you never come to see me before?" asked Esteban. "I was afraid," replied Uhha simply.